[center][permalink][img]http://flightrising.com/dropbox/banner_thunderstruuuuuuuuck.png[/img][/permalink][/center] There exists a plain so battered by lightning strikes, it's a wonder that life is able to thrive at all. But thrive it does, and for those who don't mind a bit of static shock, the [b]Thunderhead Savanna[/b] can be a bountiful hunting ground. [center][permalink]Click here to read more about today's update! [/permalink][/center] [more] [b][size=5]New Coliseum Stage: Thunderhead Savanna[/size][/b] Today marks the launch of our newest Coliseum stage, the [b]Thunderhead Savanna[/b]. This level 14 venue is perfect for dragons transitioning from Bamboo Falls to Redrock Cove. This arid plain is constantly marred by thunderstorms and lightning strikes, making its denizens some of the quickest and most adaptable foes on Sornieth. 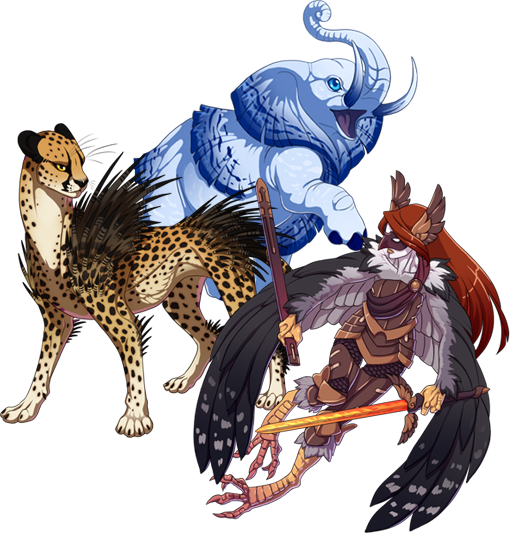 The [url=http://flightrising.com/main.php?p=coliseum][b]Thunderhead Savanna[/b][/url] introduces a variety of new items for your dragons to consume, barter or hoard. Finding each of these resources and relics can be a challenge. [center][img]http://flightrising.com/dropbox/familiars/thunderhead1.png[/img][/center] [center][item=vista: thunderhead savanna][item=pelt-lined crate] [item=Condorwing Champion][item=Falconclaw Warrior] [item=Common Locust][item=Condor's Breastplate][item=Featherhide Locust][item=Pristine Harpy Leathers] [item=Dire Vulture][item=Flesh Forager] [item=Shredded Rambra Carcass][item=Old Emptied Nest][item=Mangled Zeeba Carcass][item=Discarded Nest Material] [item=Dustfeather Sphinx][item=Magpie Sphinx] [item=Speckled Hogfish][item=Catfeather Loop][item=Ebony Hogfish][item=Glittering Sphinxband] [item=Golden Lionsnake][item=Roving Lionsnake	] [item=Marigold][item=Desert Diadem][item=Dusty Marigold	][item=Flatlands Tiara] [item=Greattusk][item=Pale Greattusk] [item=Trampled Drygrass][item=Pachyderm Painting][item=Groundfrost Grasses][item=Demise of the Big Game Hunter] [item=King Quillrunner][item=Quillrunner] [item=Herdbeast Haunch][item=King of the Plains][item=Gamy Shockshank][item=Fangback Figurine] [center][img]http://flightrising.com/dropbox/familiars/thunderhead2.png[/img][/center] [item=Ampelope][item=Starry Ampelope] [item=Livewire Endlers][item=Vibrant Savanna Pelt][item=Sparklers][item=Speckled Savanna Pelt] [item=Plainstrider Bard][item=Wintermane Minstrel] [item=Yellow Canary][item=Lost Lute][item=Red Frosted Canary][item=Storyteller's Strings] [item=Raptorik Herder][item=Raptorik Wanderer] [item=Coffee Bean Hawkmoth][item=Prairie Polearm][item=Verdemoth][item=Avian Gemstaff] [item=Rockback Charger][item=Thunderstomp] [item=Rhinoceros Beetle][item=Crackled Rhinohide][item=Lesser Bluehorn][item=Charged Rhinohide] [item=Rabid Grinfin][item=heckling hydrena] [item=Blue Buffalohead][item=Bubbly Buddy][item=Brackwater Lumphead][item=Hydrena Watertoy] [item=grassland skira][item=coursing skira] [item=Spiral Aloe][item=Hardened Clodcakes][item=Manyleaves][item=Malleable Graybricks] [item=unburdened billy][item=roundhorn rager] [item=Dustrunner Meerkat][item=Decorative Desert Tile][item=Savanna Burrowborrow][item=Beautiful Barrens Tile][/center] [br][br][b][size=5]Rockbreaker's Ceremony Skin & Accent Contest[/size][/b] The fifth annual Rockbreaker's Ceremony will begin November 25, 2018, and we're running a skin and accent contest in celebration! [url=http://www1.flightrising.com/forums/skin/2564089] Click here for more information! [/url] [center][url=http://www1.flightrising.com/forums/skin/2564089][img]http://flightrising.com/dropbox/earth_contest2.png[/img][/url][/center] [br][size=5][b]Update: Server Migration[/b][/size] Recently, our server provider was acquired by another company. As part of that acquisition, some [b]technical changes to our server infrastructure are being conducted[/b]. Unfortunately for us, the timetable for some of this changeover work is somewhat tight, and [b]may impact the website in undetermined ways[/b]. We wanted to provide you with some forewarning, as we don't have a perfect estimate of how long or short the process will be. Please see the rest of [url=http://www1.flightrising.com/forums/frd/2563948/][b]Mutron's post in Flight Rising Discussion[/b][/url] for more information. There exists a plain so battered by lightning strikes, it's a wonder that life is able to thrive at all. But thrive it does, and for those who don't mind a bit of static shock, the Thunderhead Savanna can be a bountiful hunting ground. Click here to read more about today's update! 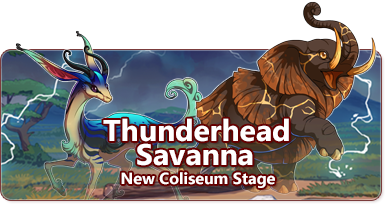 Today marks the launch of our newest Coliseum stage, the Thunderhead Savanna. This level 14 venue is perfect for dragons transitioning from Bamboo Falls to Redrock Cove. This arid plain is constantly marred by thunderstorms and lightning strikes, making its denizens some of the quickest and most adaptable foes on Sornieth. The Thunderhead Savanna introduces a variety of new items for your dragons to consume, barter or hoard. Finding each of these resources and relics can be a challenge. A small cache of treasures hidden away from the harsh sun. Trained from a very early age, these young harpy warriors are often far more seasoned in the ways of battle than rival beastclan counterparts. Though most harpies employ fairly cutthroat guerrilla tactics to battle their enemies, these practiced warriors rely on their years of blade training to press an advantage. Plague dragons see swarms of locusts as a good omen, many clans following them throughout the realm rather than eating them. It was once uncommon for harpies to wear armor, but recent run-ins with dragonkind have seen them prepare for the worst. A set of clean, supple leather armor. Harpies are not known for their armorsmithing, so this is quite the rarity. Often misunderstood due to its name, the presence of Dire Vultures often means there is plenty of food nearby. These imposing carrion birds are actually extremely tender if you're--how do we put this--alive. If only it didn't have those stark black and white "just try and come eat me, see what happens" stripes. Abandoned bird nests like this are great kindling for camp and cooking fires. This unlucky Zeeba is feeding a family of four tonight. The dried up remains of a vulture's nest. A smattering of old eggshells are tangled in the twigs. It is not uncommon to see a Dustfeather Sphinx standing completely still. Don't mistake this for stoicism; it can use this unique stance to store energy to aid it in quick and relentless pursuit of prey. The Magpie Sphinx will often try to camouflage itself with the sky of the savanna, which is always a roiling amalgamation of the grays and blacks of the storm season. If you were waiting around for to this fish to oink, you're likely going to be disappointed. A polished ring depicting a winged feline. The eyes glow with a soft green light. This friendly ocean-dweller coexists harmoniously with the not-often-seen Ivory Hogfish. It is not an uncommon sight to see blended schools swimming near coral beds. The gleaming silver beast that wraps around this valuable ring is said to ward off feline predators. Probably not best to rely on that, though. Lionsnakes can use stored up kinetic energy in their spiral-like bodies to launch themselves at unsuspecting prey. This offshoot species of lionsnake often spends much more time lying in wait than its golden cousin, using thick grasses and its speckled coat to blend into the terrain. Marigolds are popular in decorative food dishes, their bright florets adding an interesting pop of color. A gorgeous crown of hammered brass and inlaid wood. Where this plant lacks in vibrancy it makes up for in deliciousness. Placing this crown upon your head won't bestow you monarchical powers, but you'll probably look pretty cool. Even the largest and strongest dragons have a hard time besting a Greattusk; their immense size, weight, and sharp tusks make them formidable adversaries. But have you ever seen a Greattusk fly? A beautiful oil rendition of the face of a Greattusk. The artist was really able to capture the fact that elephants are pretty scary. This bluish grass isn't named for its ability to break through frost, but for its resemblance to it. A positively chilling artistic depiction of the last thing a hunter will ever see out on the dangerous rolling hills of the Thunderhead Savanna. Although lionsnakes may seem like the leaders of grasslands, these supercharged cheetahs use the atmosphere of the region to aid their sprints, almost never tiring when closing in on their prey. A fight with a Quillrunner is a dangerous task no matter which way one approaches. A wise dragon never says no to leftovers. A stylized onyx statue depicting a King Quillrunner stalking its prey. You know when someone tells you that the meal will have a little "kick"? This is what they're talking about. A stylized quartz statue depicting a Quillrunner stalking its prey. The constant electrical charge that permeates the warm air of the arid savanna acts as an energy boost to this already spry creature. Catching one is extremely difficult. The speckled patterns that dot this antelope's flank resemble a cluster of constellations. Groups of these electro-conducive fish are routinely kept in glass jugs. Their internal glow and highly-reflective scales mixed with the refractory qualities of the water make for an amazing light show. Rubbing your claws on a woven rug aint got nothin' on the shock you'll get from this charged pelt. Known for their reflective, multi-colored scales, this species of guppy are often saved from the lunch basket by the impressive glittering performance they use to get away. Once thought to be a natural pattern, it has been discovered that the spots along the hide of this type of ampelope are a residual discoloration caused by small arcs of electrical energy connecting different hairs. The centaur beastclans have long excelled at diplomacy, and much of that can be attributed to their usage of bards and music to ease tensions. In addition to their trusty instruments, these performative centaurs use their voices and a rhythmic tapping of their hooves to spin songs and tell tales. Canaries make great dragon snacks, but are more often kept as natural alarms. Their call is loud enough to act as a warning about plague gasses nearby. The forgotten instrument of a passing bard. The strings are fraying and the wood paneling is starting to dry up and pull apart. A sad sight for avid musicians. This non-migratory bird is not popular among dragon clans whose members have a diverse array of diets. Flocks of them will absolutely decimate stored seeds, berries, and arthropods. The body of this lute is covered in scratchmarked script of the names of various locations around Sornieth. Although agriculture and animal husbandry are rare on the savanna, some Raptorik beastclans have developed a way to lure herds into traps and enclosures for easy hunting. These beastclan emissaries act as guides in the great trek across the grasslands. Some tribes have allied with dragonkind to earn a steady income of gold. Sluggish in the mornings, this moth is an enthusiastic powerhouse during the day. Every part of this decorative staff was gathered from the plains. "Proboscis" is clearly an understatement. While this bejeweled staff doesn't itself carry any magical powers, it appears as though it does. Which might make all the difference to how its wielder fares in battle. This robust beetle makes a startling screeching noise when disturbed. You've been warned. Working a hide of this nature can only be accomplished by earth dragons, who have a natural affinity in magically manipulating the rough stone-like protrusions along its surface. This massive beetle has one of the hardest shells in existence, making it a real chore to break apart and eat. Might as well have called it Crab Dinner Beetle. Before this hide can be tanned and worked into armor, its perpetual electric charge must be forcefully neutralized in some way. Having developed an evolutionary affinity for water, it isn't uncommon to come across a family of these hyenas floating in lakes and watering holes to beat the heat. You'd think the forehead protrusion would be a delicacy or something. Nah, just a bunch of useless cartilage. Better than an actual hyena in every discernible way. The larger the lump, the more popular the specimen. This is a totally normal thing for a slavering mongrel to be carrying around. Skira use their long necks and even longer tongues to strip leaves from the highest branches of grassland trees. These slow, towering plant-eaters carve a predictable route through the savanna, often wearing down a well-trodden dirt path for others of their herd to follow. The thick, serrated leaves of this aloe plant wither and dry up not long after harvesting, making them more of an "in the moment" kind of snack. An unusually strong compaction of savanna dirt. This lightning-resistant aloe plant clings to the highest points of the skyscraping escarpments ringing the Thunderhead Savanna. It gives the mouth a slight tingle when consumed. Useless for any sort of structure, these soft bricks can be molded and fired into pottery. A domestication effort gone awry, this totally-not-tamed-at-all Rambra is out for vengeance. Steer clear! Empowered by revenge and a strong jolt of electrical energy, this rampaging beast will stop at nothing to trample its would-be captors. This quirky species of meerkat has developed an unlikely cohabitation with the tusked boars of the region. A pretty matte tile with an interesting pattern. This feisty mammal prefers to move into the hollows dug by other creatures rather than spend time excavating its own. A gleaming tile with a complex pattern. The fifth annual Rockbreaker's Ceremony will begin November 25, 2018, and we're running a skin and accent contest in celebration! Click here for more information! Recently, our server provider was acquired by another company. As part of that acquisition, some technical changes to our server infrastructure are being conducted. Unfortunately for us, the timetable for some of this changeover work is somewhat tight, and may impact the website in undetermined ways. We wanted to provide you with some forewarning, as we don't have a perfect estimate of how long or short the process will be. Please see the rest of Mutron's post in Flight Rising Discussion for more information. I saw the Ampelope in the Bestiary and hopped in, all excited to see a new Coliseum venue – because I love venues, and I love familiars. And it looks wonderful. Great design. I am ready to do some hard farming and love it. I was running out of fresh familiars anyway. I adore the 'lopes, the Hydrenas, and the new Skiras especially. And all the cats, and elephants, and these lovely blues and greens. They're beyond reproach. I've already got a familiar and some coffee-addicted moths, and this is a great way to finish off my evening. But honestly, FR team… I’m feeling a little exasperated with this, too. What’s it going to take before we can get a Plague venue? Lightning already has the Golem Workshop, and more nebulously the Sandswept Delta. Plague has been perpetually stiffed and I just get more and more :/ every time elements get clear doubles or even triples with these new releases. Please give the Scarred Wasteland some love. It’s a perfect backdrop for a venue. edit: first time on the first page! - Talk to me about metal and rock!